Winter worked on Broadway before heading to California and landing her first bit part in 1943's What a Woman! starring Rosalind Russell. A series of 'B' pictures followed before Columbia decided not to pick up her option. Adding the 's' to her last name, Winters was undaunted and in 1947, she landed a meaty role in A Double Life as a waitress who gets murdered. With A Place In the Sun (1951), she again played a murder victim. She was nominated for a Best Actress Academy Award for her role as the ill-fated frumpy wife of Montgomery Cliff - who ends up at the bottom of Lake Tahoe. Now a top star, she worked frequently throughout the 1950s and unlike some other celebrities of her stature, she easily alternated between television and feature films. In Charles Laughton's excellent Night of the Hunter (1955), she once more played a hapless wife whose body is found under water, this time at the hands of Robert Mitchum. With her neck slit. It's an astonishing film and unfortunately, the only one that Laughton would direct. 1959 would bring Winters her first Oscar in a supporting role for playing Mrs. Van Daan in The Diary of Anne Frank. A second in the same category would follow in 1965 for A Patch of Blue. By the '60s, Winters had studied at the Actor's Studio in New York...and the "method" way of acting would be put to good use in films such as 1968's Wild In the Streets. In it, she played an overbearing mother in an utterly insane story about people over thirty being sent to concentration camps. She followed her tour de force in the violent Bloody Mama (1970) with back to back roles in two 1971 horrors directed by Curtis Harrington: What's the Matter with Helen? and Who Slew Auntie Roo? What's the Matter with Helen? co-starred Debbie Reynolds and was a wonderful mystery in the grand guignol tradition about two women who flee to Hollywood to escape notoriety after their sons are convicted of a vicious murder. They open an acting school for young moppets and soon find themselves threatened by someone who has tracked them down. Both Reynolds and Winters were superb, with Winters chewing the scenery as loopy Helen. She played crazy again in Harrington's Who Slew Auntie Roo? - a variation on the classic Hansel and Gretel story. A departure from the way others might have approached the part of Rosie Forrest, Winters comes across as strangely sympathetic. That same year, she made the television thriller Revenge in which she sets out to punish the person responsible for the death of her daughter. As with Ray Milland (her male counterpart during this same period), Winters reveled in taking unusual parts in quirky films...many of them horror. She lampooned her weight in an episode of Here's Lucy with Lucille Ball and then...ever the method actress, Winters gained even more for her poignant turn as the chunky but doomed diver in The Poseidon Adventure, one of 1972's biggest blockbusters. It paid off and she received yet another Oscar nomination for Supporting Actress. Winters enjoyed working in television, noting how large the viewing audience could often be - and how she would be mobbed in public the day after her films aired. Of Made-for-TV horror movies in particular, she said they were "the networks' way of getting around the anti-violence pressure. If you get garroted by a ghost, it's okay." In The Devil's Daughter (1973), she played a Satanist and had a field day. 1976 saw her again on the big screen in Roman Polanski's The Tenant, in which she appeared as the concierge. The following year, she had a role in the Italian production of Tentacles...one of the many films that flourished in the wake of the success of JAWS. This time, an octopus was the threat and Winters headed a cast that included Henry Fonda, Bo Hopkins, Claude Akins and Brian Keith. The Initiation of Sarah (1978) was a fun TV carbon of Carrie in which Winters was the house mother who pushes Kay Lentz to use her formidable telekinesis to wreak havoc against a rival sorority. 1979's The Visitor (aka Stridulum) also concerned a young girl with special powers but the often incoherent film, with its science-fiction bent, is difficult to describe and was maligned by critics and ignored by the public. However, Winters was good and the movie is a bit underrated. Winters continued to work throughout the next two decades (and wrote two volumes of memoirs) although her forays into the horror genre were over. Some might quibble with her choices over the years, arguing that she took any role offered. But there's something admirable about an actress wanting to work regularly...and in character parts that are not necessarily flattering. Like Bette Davis, she was always entertaining...whether in one of the many offbeat thrillers she appeared in (such as a lesbian drug dealer in Cleopatra Jones)...or even as Roseanne Barr's grandmother on the hit TV series in the '90s. You never take your eyes off her. Brash and bold as hell...a true original. 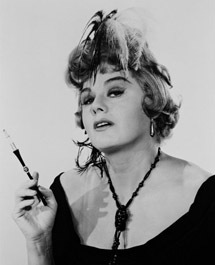 Shelley Winters passed away on January 14th, 2006.